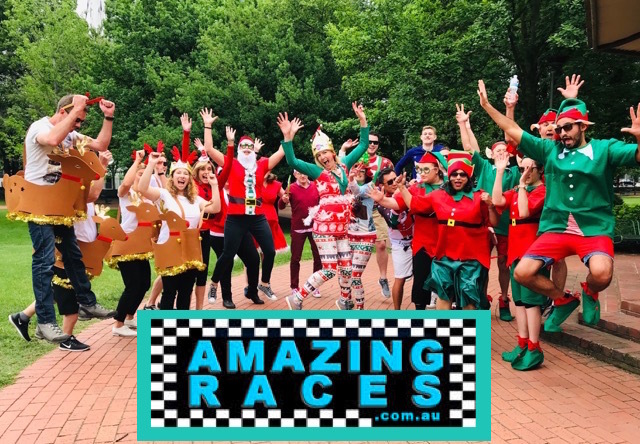 Get your elfing shoes on and jump for festive joy on the best fun urban adventure challenge Sydney Amazing Races activities Christmas bonanza. Its that festive season time of the year again and we are ready for your activities group to get racing to your secret santas work party celebration location. That’s the stash where all the free foods and drinks are at! We will get you there on time and ensure you have some wild tales and stories to share with your work colleagues. Show them who’s boss and book now for some free excellent surprise treats to be thrown in. The best value team building activities we can muster. Start in your offices, at work sites and complete 9-14 amazing challenges, tasks. Roadblocks, Detours and yields along the route. Through The Rocks, Botanic Gardens and Sydney Harbour Coves. Navigate lanes and alleyways to Barangaroo, Darling Harbour and Pyrmont. Explore China Towns famopus eateries for congealed pigs blood, snails or stay safe with Tofu skewers. Allow Amazing Race Sydney experts create your custom built journey of Christmas fun surprise discoveries.